For centuries, traders and herdsmen slipped through Nathu La into the Chumbi Valley, a slice of Tibet between Sikkim and Bhutan. The gateway for muleback silk caravans — the other pass used was Jelep La which linked Lhasa to Kalimpong — it even ushered in the Dalai Lama in 1956 when he showed up on horseback to participate in the 2500th Buddha Jayanti celebrations. Well it all started with a promise and peldge not to travel after the recent fantastic North Sikkim tour in April - the pledge being no more travel and save for Leh and Ladakh at end September. As such though son's school summer holidays were going on, I was sitting tight. Only a weekend tour was done to Kuldiha Forests, Orissa, and it was as usual very good too. 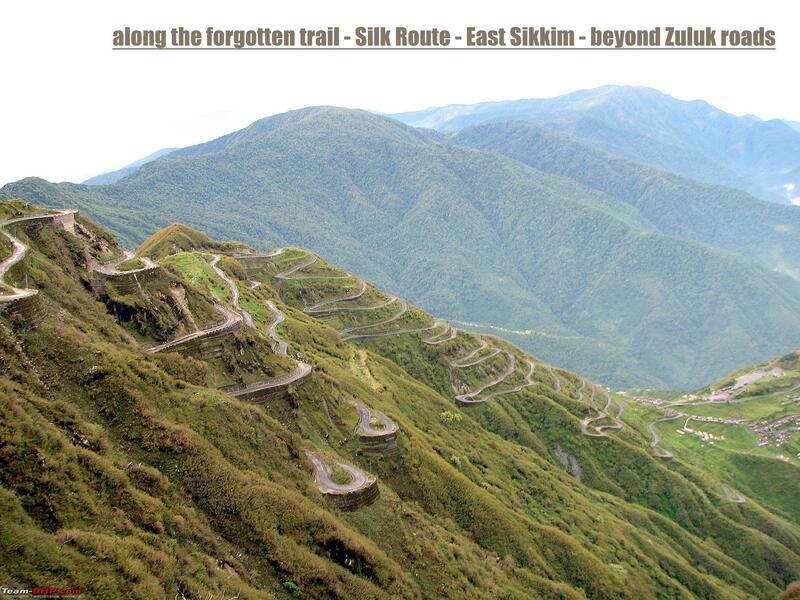 But as fate would have it, I read up an article on the Silk route and some places in East Sikkim - places which most people of Sikkim themselves knew very less/nothing about. A route that is both historic as well as adventorous. A route that played up in my mind and but then as I thought of costs and a tour too so soon again, I just thought may be latter someday. But then as luck would have it, one of my friends call up and say that they are free for a week and wanted some good place to be holidaying and if I knew of some place like that. He was looking out some place in the hills and with most known places fully booked due to the summer holidays, he was helpless as to where to go. Well immediately I had this silk route places discussed and he was okay along with his wife. Now the good thing was that my budget has halved - the big problem now about the work situation. Found out that remarkably Airtel has mobile connection in almost all the places except one[Zuluk] and thus datamodem connection will help me manage my work front while on tour. With very few information with regards to those places, it was a journey that had a different aspect. A historical aspect as pedong-rishi-aritar-zuluk-jelep la formed the ancient silk route. Another fascinating thing about this journey was the fact that we were travelling in places and meeting people who have just about seeing tourists. As a result the interaction with the local population was fantastic and the entralling old time stories from venterans in Zuluk was and will be ever in our memories. We travelled as much possible in those days along the old Silk route, though some places were left we covered almost the whole of it. 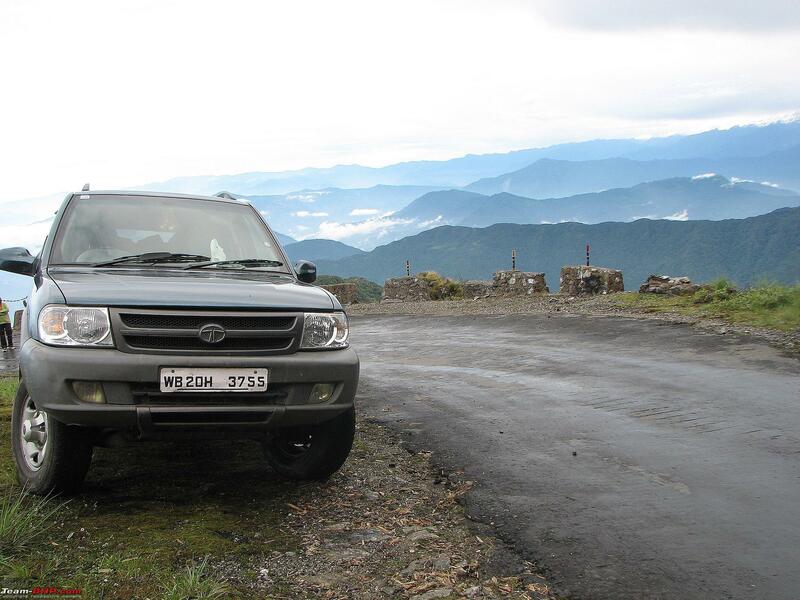 More importantly we did the loop to Gangtok via changu for which it is very difficult to get permit. 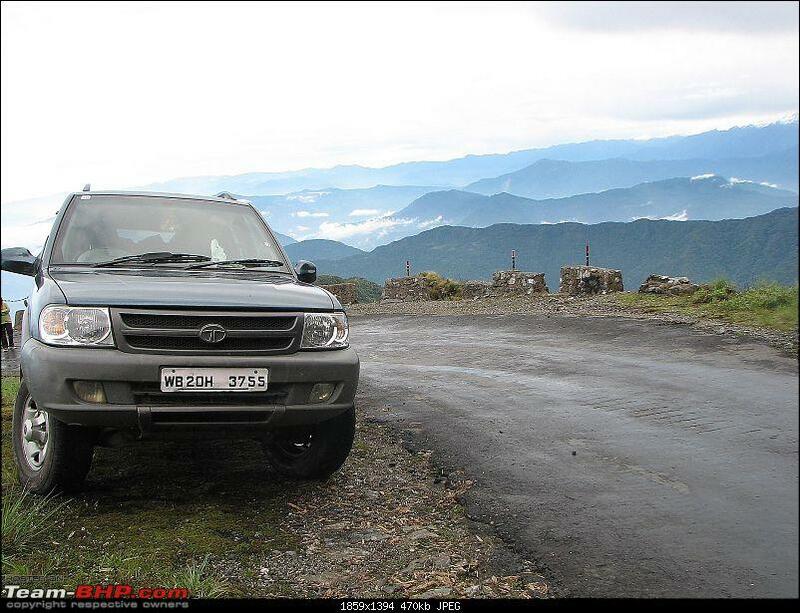 The most common route from Gangtok is to Changu and sometimes when route is open to Nathula. 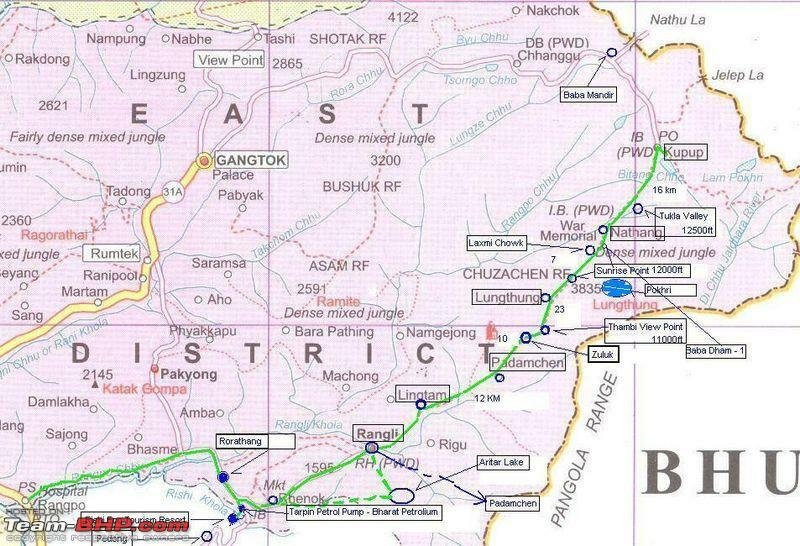 But the silk route that it was, made us travel the opposite way around, from Pedong to Rishi to Aritar to Zuluk via Padamchen and Lingtam and then ownards to Kupup and the orginal Baba Mandir [Baba Dham] - which one will not be able to see until the route is done anti-clockwise. These places must be done around November or March-April months when the weather is absolutely clear with no clouds and/or with snow on the road - the vistas would be more fantastic, rugged, and absolutely enchanting. As usual, the Safari VTT-TMT took everything in its stride. Bad roads, rough roads, 4-5 hours of continuous 1st/2nd gear travel, waterfall crossings - any stranding on this route and it will take at least 5-7 days for extraction. Last edited by adc : 9th June 2009 at 18:15. YOU LUCKY FELLOW... why? Check the starting & ending pic, you know why! What else i can say. Good start, Waiting for full!! Are you planning for Leh trip in this sept? Wow, Another wonderful teaser, cant wait to see more and read more as well. As Mahesh aptly said, "YOU LUCKY FELLOW"
Thats one beautiful pic. 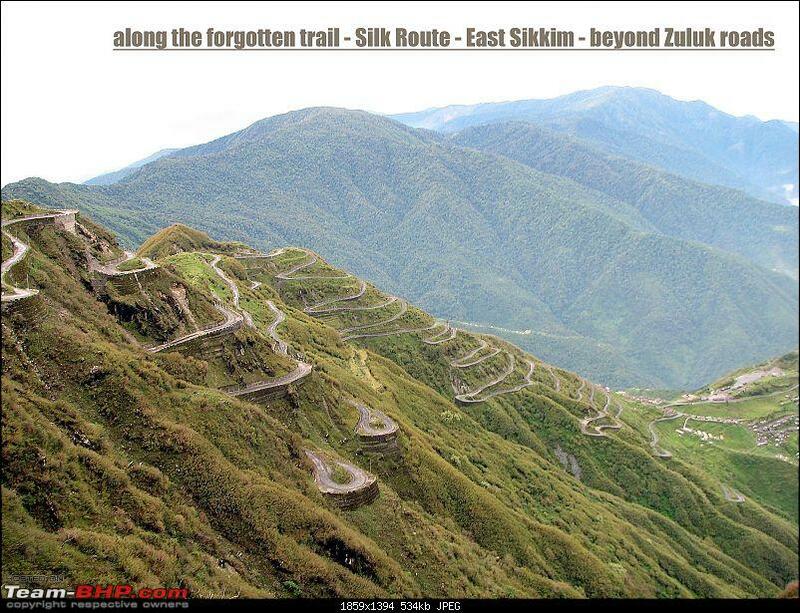 And Silk Route; remember about it from my history lessons during school days. I salute you. As usual, incredible pics to start with. Please keep them coming. Can't wait for more. ADC, great route. Had I known about this route, would have spent an extra 2 days in Sikkim too! Quite a discovery! Very informative map, but I don't see Rishi marked there. Any permits required to go from Rangpo to Zuluk? And did they insist on the permits when you returned on the Changu route? Man O Man, lucky fellow. Nice teaser and nice snaky 1st pic. Also loved the background of Safari in last pic. Certainly this travelogue will again be amazing. Great start ADC. Another great travelogue on the way. This is definitely a very less travelled route. Did not knew about it. Keep it coming bro. 1 question: Can this route be done in an Esteem? Great show ADC. You are soon going to be named Marco Polo on wheels. Seriously I love the zeal with which you come up with such unusual exploratory routes and then share them with all of us. I quite envy the way you manage to get the time to do all the exploration, as well. 1 question: Can this route be done in an Esteem? Probably two Esteems could do it Saurabh? The first picture is awesome, quite a handful of those serpentine curves! Waiting for more. Yes of course, I am game. With every travelogue, ADC has been raising the bar and setting a new benchmark. Waiting with bated breath. Breathtaking teaser pictures. Now it's hard to wait for the real content! Waiting for the detailed report! Pl. put up the entire travelogue with loads of pictures.